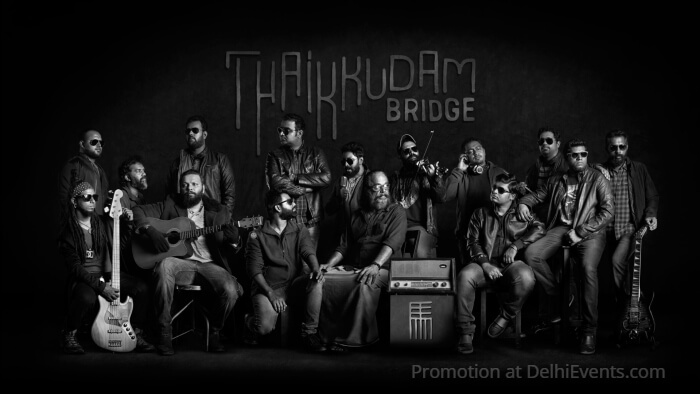 The cult Kerala band, Thaikkudam Bridge, shot to fame with their renditions of old Malayalam film songs, in a medley titled Nostalgia on the Music Mojo show on Kappa TV on YouTube. Following this, they showed their versatility with an unimagined cover of Metallica's 1992 hit, Nothing Else Matters as well as covers of Hindi film songs. To show they were not just cover wonders the band released originals, along with the infectious Fish Rock which remains a concert favourite. The band's music seamlessly blends rock, reggae, Hindustani and Carnatic music, producing some profound, grounded melodies that seem even bigger when they perform live. With larger-than-life arrangements, their finely crafted sets employ powerful vocals, violin and guitar parts that make you watch in awe, even though a they often perform in a language most of the audience doesn't understand - Malayalam.